Ready to go from renters to homeowners? These first-time home buying programs may help your homeownership dreams come true this spring. 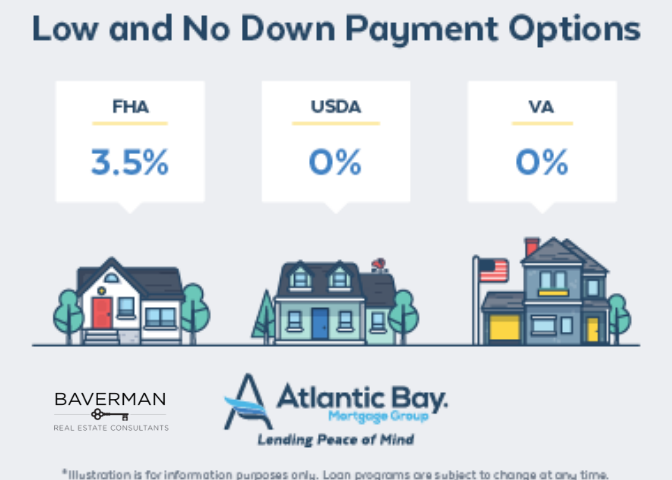 FHA, USDA, and VA loans all offer little to no down payment options. While you’re out shopping, remember you don’t always need 20% to put down. If you don’t have a 20% down payment, these loans may be good options to explore. Note: Have you considered using gifted funds for a down payment? If you’re about to get married (or recently did), many loan types allow gifted funds as a down payment. It’s becoming more and more common to ask for “house money” than actual wedding gifts! Home buyer assistance programs exist to help first-time buyers navigate the home buying world. These programs are available at both local and national levels. Devorah Shaw at Atlantic Bay always available to help answer questions about grants and other programs to give you all your options. Get closing costs covered by the seller. We can negotiate to get some or all of your closing costs paid, decreasing the cash you need to close. Please check out Atlantic Bay’s First-time Home Buyer Checklist and New Home Wishlist as you search for homes.